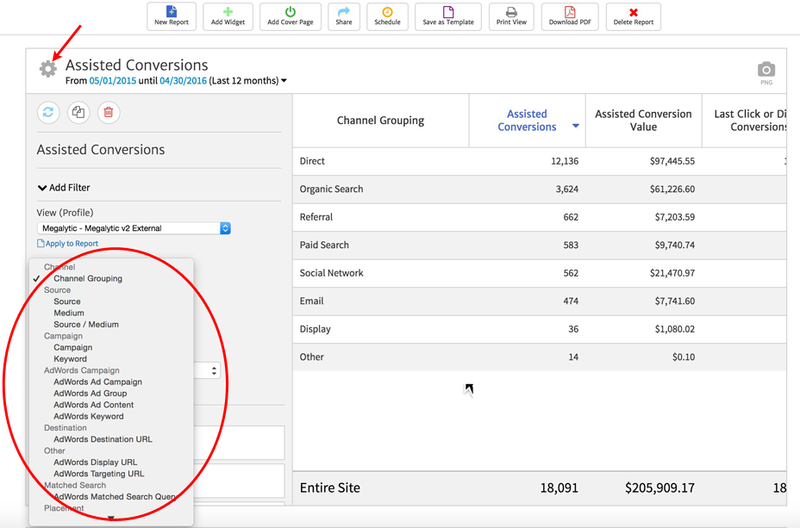 Megalytic provides an “Assisted Conversions” widget that you can use to display Google Analytics’ Multi Channel Funnel data. When you drag this widget into a report, by default it is configured like the Google Analytics’ Assisted Conversions report. As shown below, the default Channel Grouping is used by default for the dimension. You can change the dimension used in the table by opening the widget editor (click on the gear symbol), and clicking on the Dimension selector. A wide variety of dimensions are available including Source, Medium, Source / Medium, Campaign, AdWords Campaign, etc. The metrics that are available mirror those that you find in the Google Analytics report: Assisted Conversions, Assisted Conversions Value, Last Click or Direct Conversions, Last Click or Direct Conversions Value, Assisted / Last Click or Direct Conversions, First Click Direct Conversions, and First Click Direct Conversions Value.